Here’s some snippets of the last MATM rehearsal, as they feverishly prepare for their Gappy Tooth Gig on Saturday 28 March at the Wheatsheaf. Moogieman And The Masochists are proud to announce our forthcoming gig at the Wheatsheaf under the auspices of Gappy Tooth Industries. Last month Gappy Tooth celebrated their 100th show, and over the years they’ve built up a considerable reputation as one of Oxford’s most interesting, elclectic and horizon-expanding gig nights. 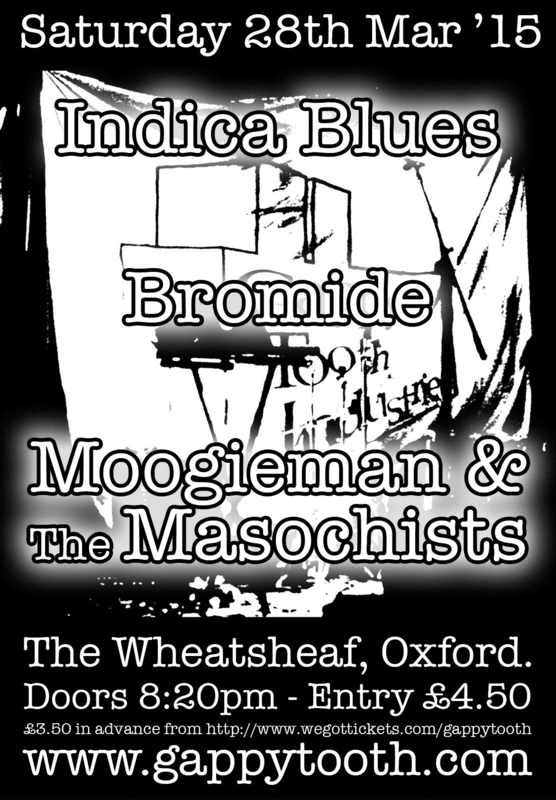 That means the other acts on Sat 28 March, Indica Blues and Bromide won’t be anything like MATM, but will definitely be worth seeing. STOP PRESS: Advance copies of the forthcoming Fruit download and cassette EP will now be available for the gig.